'It's A Beautiful Day!' Seacrest Beach Villa- Sleeps 10- Great View!! 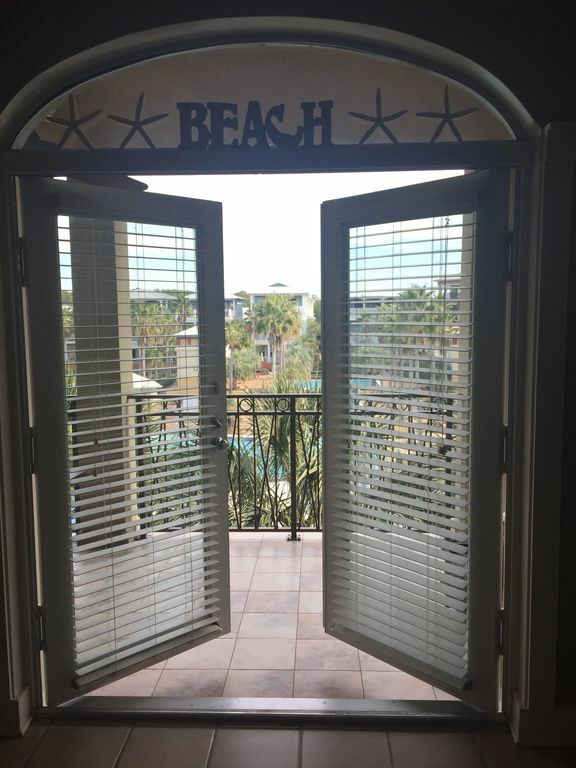 "It's a Beautiful day" located in the beautiful community of Seacrest Beach, is a comfortable, updated condominium overlooking a 12,000 square foot pool. Enjoy the view from our comfortable balcony. This condo is located on the 3rd. floor which has an elevator and is handicap accessible. We're nestled between Aly's Beach and Rosemary Beach where you can enjoy remarkable restaurants and plenty of shopping available within walking distance. This beautifully decorated condo is 2,000 square feet, 4 bedrooms, 3 baths with all the amenities of home. We stock our condo with all the amenities (paper towels, paper products, laundry supplies and spices) for your convienence, wireless internet, 5 flat screen TV's, Blue ray DVD, HDMI, Netflix & board games. Check out reviews, you will not disappointed! Wally & I enjoy vacationing as much as possible. After a life changing journey 11 years ago, we enjoy every minute of every day. Every day is a Beautiful Day! Wally & I fell in love with this condo as soon as we saw the pool from the balcony. We knew this was for us. We enjoy spending time here with family and friends as much as possible. The unit overlooks the beautiful pool and the HOA has a shuttle to take guests back and forth to the beach if they wish. It's located in the middle of all the great restaurants and shops that 30A has to offer. Also, no need to rent chairs or an umbrella. We have 6 beach chairs, 1 umbrella and 1 bike available for your use. Laundry supplies provided to renters. Building A - 36 Seacrest Beach Blvd. West. New furniture, pull out couch, sleeps 2. Keurig and regular coffee makers available. I keep the condo stocked with paper products, some spices, some condiments and laundry supplies. The kitchen is well stocked with cooking essentials, waffle iron, crock pot, electric griddle and many other extras. 2 additional seats at the island in the kitchen. All flat screen televisions in all bedrooms and family room. 3 drawers full of the latest family games. View of the beautiful pool! Brand new table with 6 chairs & 2 additional chairs with ottomans. 2 ceiling fans to cool things down in the summer months. Available to rent at the beach. 1 bike available for your use. Condo overlooks 12,000 sq.ft. Pool & concert area. The perfect updated getaway! We have 6 beach chairs, 1 umbrella and 1 bike available for your use. What a wonderful oasis - everything was perfect, easy and accessible. We absolutely loved our stay and are planing our return. I have not had this easy and restful vacation in years. The apartment is huge, the kitchen had everything one would need, publix just down the road, and restaurants withing 2 min walk. The views of the pool from the balcony and the beech is 5 min walk. We all loved it and felt our stay was too short. Thank you! Please come back and stay longer. The condo was so clean and nice! We really enjoyed our stay and Janet was so accommodating and helpful! Highly recommend, would return! Thank you! I hope you return soon. Very clean and great location! We love the pool! Lovely place! Highly recommend to anyone! Thank you! We're so happy you enjoyed your stay. Please let us know when you're planning your next beach trip. You have the most beautiful condo with the most comfy beds. There is a gorgeous view of the of the enormous pool with waterfalls. Your own private parking spot. There is so much to do in the area, but it’s small and quaint. We loved staying in your condo and will definitely plan to stay again!!! Thank you for sharing your wonderful home with us!!! Thank you for your kind review. I hope you’ll come back again. My family so enjoyed our stay st your lovely condo. It was beautiful, well maintained, and convenient to everything. The owners were wonderful to work with as well! I highly recommend this unit and hope to return next year! Thank you! Thank you! We hope to have you back for your next beach vacation. You need to come here! Amazingly beautiful, terrific location, and no detail overlooked. Wonderful! Property was very clean, well appointed, beautifully decorated, and fully stocked for guests’ convenience. Community is charming, folks are very friendly. Security was quick to handle the passes and the overall check-in process was simple. This was our first trip to Seacrest and we explored many restaurants and enjoyed them all. We will definitely be back because Janet & Wally made it feel like home! Thank you for your review! We’re thrilled you enjoyed your stay. We hope you’ll come back for your next beach vacation. Seacrest Beach is walking distance to many great restaurants and shops. It's located next to Rosemary Beach and 8 miles east of Seaside, FL. $500 deposit must be received within 7 days of placing your reservation. Balance and security deposit due no later than (21) business days prior to your arrival date. We are licensed by the state of Florida and pay sales/bed tax monthly.